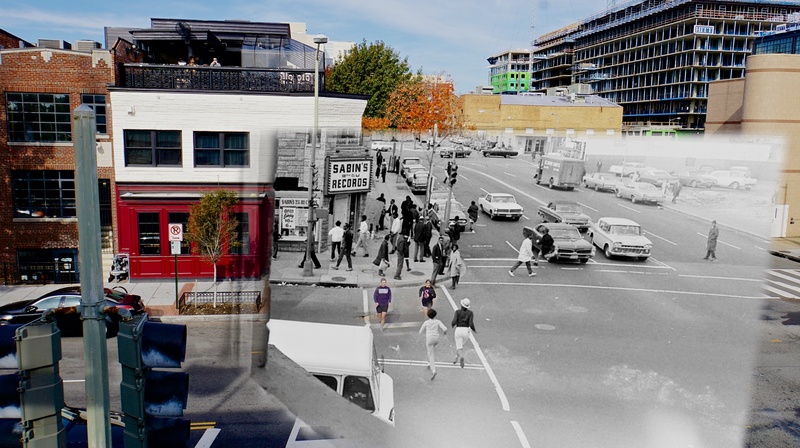 Composites of the intersection of Florida and 9th Streets, taken 1968, the day Martin Luther King was assassinated, and today (2014) following resurgence of this part of Washington, DC, USA. What was formerly Scurlock Studios is now Nellie’s Sports Bar, part of the vibrant lesbian, gay, bisexual, and transgender community in our nation’s capital. A crowd mills in and around Sabin’s Records at 9th & U Streets NW, Washington, D.C. after the assassination of Dr. Martin Luther King Jr. on April 4, 1968. Note plywood being handled on the 9th Street side of the building. This viewpoint is from the offices of Scurlock Studios at 900 U Street looking toward the northwest corner where U Street intersects 9th Street NW. At this intersection Florida Avenue runs to the East and U Street runs to the West while 9th Street runs north and south. Part of the WUST radio station can be seen on the building one block north on 9th Street at V Street NW. Photograph by George Scurlock, Scurlock Studio. Courtesy of the Smithsonian Institution, National Museum of American History: Archives Center.